Promising signs for this years spawning runs. 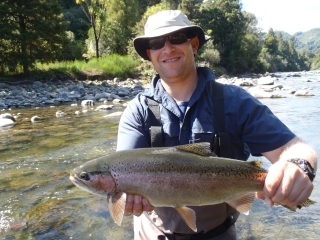 Favourable conditions have allowed many anglers to explore much of the great lake which has triggered a large amount of good conditioned trout to be caught by most boaties. The trout are not the biggest and far from the glory years of the 70s and 80s but they are in great condition and there’s plenty of them. With good conditioned fish about hopefully the up and coming spawning runs will be exciting with trout which are strong and fit and willing to fight till the bitter end. Lake fisho’s have been doing quite well in the western bays and on the Waitahanui straight at firstÂ and last light using most methods which involves trolling some sort of artificial lure or fly. Jiggers will always do well on the right reef or drop off using smelt patterns or woolly buggers gently pulled up and down-mid numbing stuff really!! The Tongariro has many mixed results but in general things are tough going but should start to turn around in the next few weeks with the colder starts and winter on the way. There are always some big brownies in most of the middle reaches pools which can be targeted with the right sunny conditions and a feeding trout but in general they have been a little hard to catch as well. The lower reaches have heaps of trout hanging close to the edges and in places which are very hard to cast at but on the change of light or in the pitch black they come alive and move about the river feeding hard which allows the keen anglers to have a crack at a very good fish. Large wet flys are used really effectively in these conditions,I quite often have clients questioning the size of some of my flies but if you open a brownies mouth wide open you will soon realize he can fit a Quail in it with no problems. 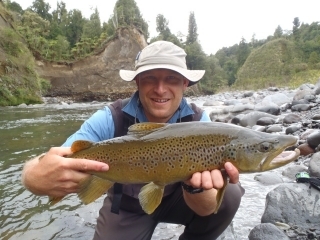 River mouths have been productive at night and in the mornings which have been producing some nice brownies and small but well conditioned rainbows. Wet lining being the obvious way to get best results using Woolly Buggers or Lumo patterns at night. Depending on the river you are fishing you will need a simple floating line or a sinking tip to allow you to get deep enough to entice those lurking trout. Go to spots at the moment would be the Waitahanui, Tauranga Taupo, Mapra and the Waimarino mouths. As you can see from the pictures attached the backcountry fishing has been very good with plenty of trout taking the dry fly and the nymph. Conditions are perfect at the moment with bright days an low water conditions . Low water is very important when targeting trout in these waters as it will concentrate the trout in the head of the pool allowing you to do less blind fishing and move through pools quicker covering more water. 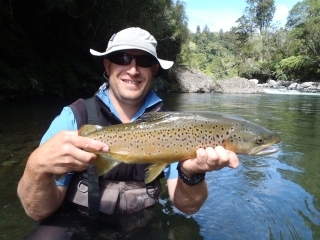 They feed well in these conditions and switch ofÂ when thereÂ is dirty or rising water which is odd as itÂ is totally the opposite to fishing the Taupo rivers. Fishing pressure in the more remote rivers has been moderate so it is important to get going early and cutÂ a track up your favourite river early as to not be disappointed when you see anglers ahead of you flogging your water to death. Trout at this time of year are in very good condition as itÂ is at the end of the season so they have had plenty of time to get fat on all the nymph and insect life during the summer months. This condition will see them through the tougher months of winter and the tough physical trauma fish will endure during spawning. I expect the hot fishing will continue till the next hard rain or cold snap so timeÂ is running out and if you have any sick days stacked up you may want to use some quick.